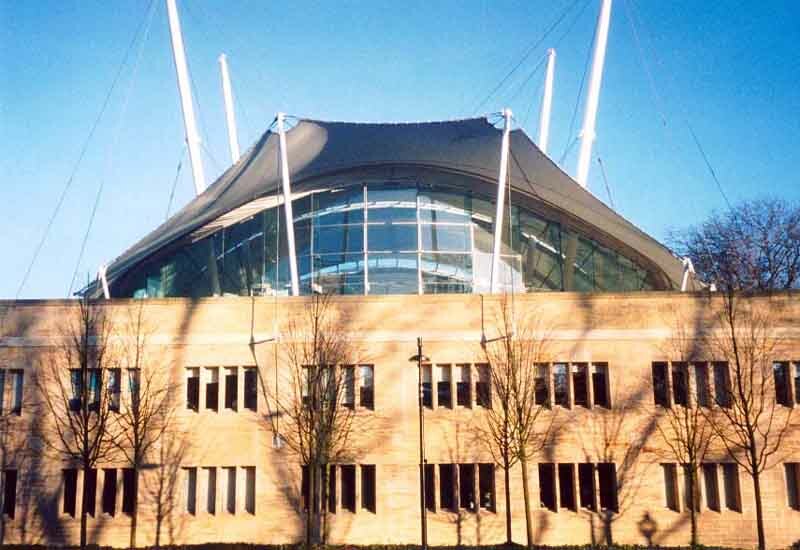 Trademark Michael Hopkins Architects building parachuted into town: exciting form with a delightful contrast between the old red sandstone base and the delicate white floating fabric above: make sure you see this from the southern elevation round the back aswell as the more-photographed front view (right) with amphitheatre context (good place to view the Scottish Parliament). ‘Our Dynamic Earth’ is one of the Millennnium Commission’s largest projects in Scotland to date. 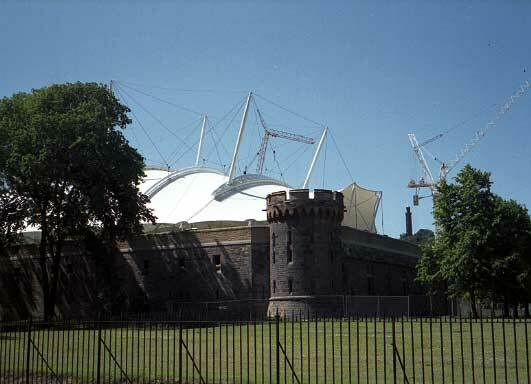 The basement of the former brewery forms the base with a concrete frame structure above topped with eight 24m-long steel masts covered in a tensioned fabric membrane. Views to Salisbury Crags from open-air terrace: Dynamic Earth building by Sir Michael Hopkins atop a retained brewery base. 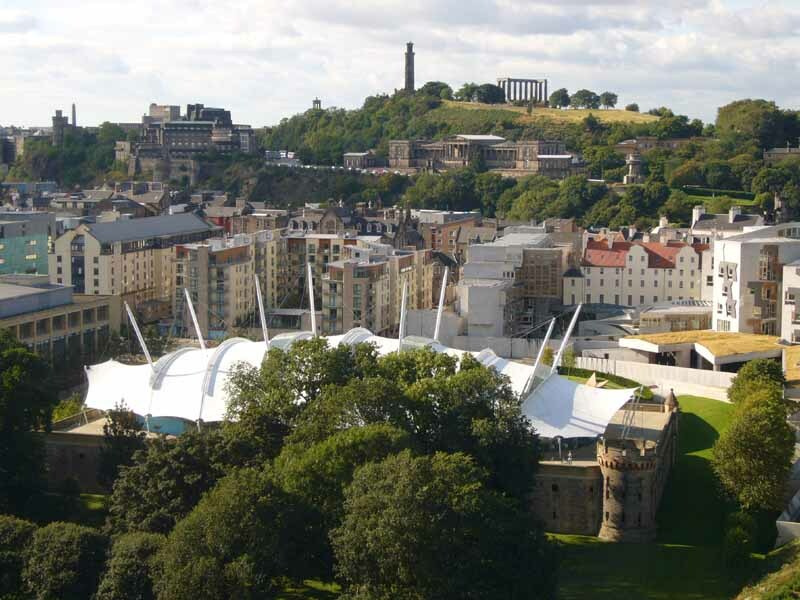 Our Dynamic Earth is a key part of the Holyrood Project, an urban regeneration plan steered by Scottish Enterprise Edinburgh & Lothians, which has brought new vitality to the former industrial land at the lower end of the Royal Mile. 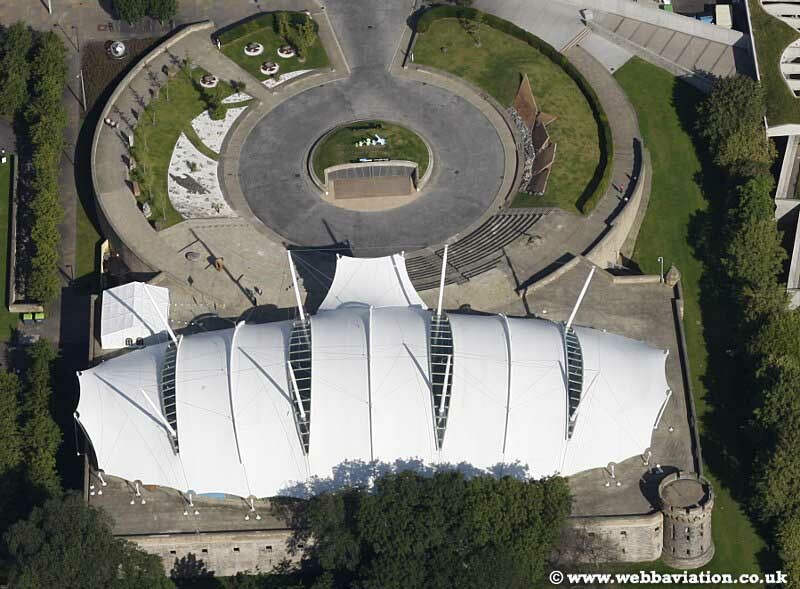 The William Younger Centre houses the ‘Our Dynamic Earth’ Visitor Attraction. The project attracted substantial funding from the Millennium Commission. ‘Our Dynamic Earth’ is a permanent exhibition & education centre, designed by Michael Hopkins & Partners to facilitate a better public understanding of the processes that have shaped the Earth. James Hutton, renowned as the Father of Modern Geology, provides the key to the conceptual framework of Dynamic Earth. Dynamic Earth has roots in both the culture and landscape of Scotland in general and Edinburgh in particular. It is also rooted in the scientific research which has gone on within the institutions in the city and which continues today. Edinburgh’s much-admired urban character comes from a balance between nature and artifice, between the geology of its magnificent setting and the way generations of architects have refined its topography to create one of Europe’s most elegant cities. The striking form of Michael Hopkins & Partners’ Dynamic Earth adds to the tradition. 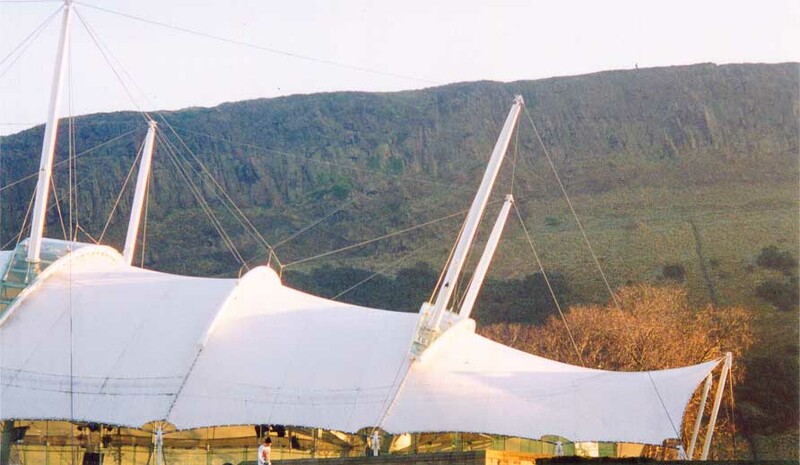 Our Dynamic Earth’s smooth, flowing curves and taut, minimal cables and masts offset the rugged majesty of Arthur’s Seat and Salisbury Crags. Just as Our Dynamic Earth’s appearance suggests a relationship between nature and artifice, so its purpose helps visitors to understand that relationship. 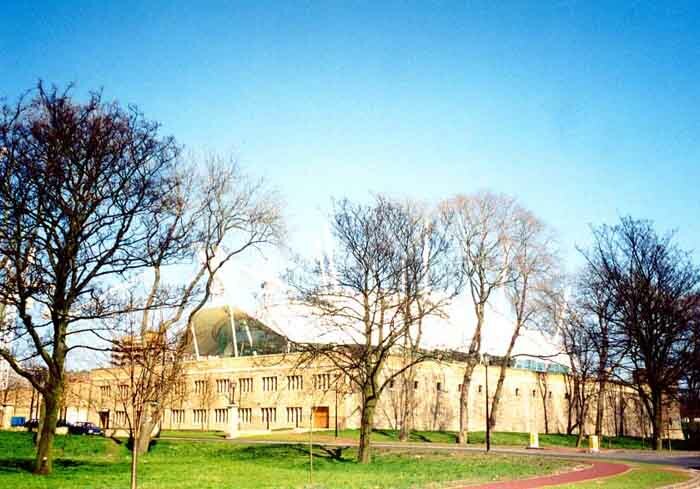 Located in Edinburgh close to where James Hutton, the father of modern geology, lived and worked in the 18th century, it is an appropriate site for the Dynamic Earth exhibition. Interactive, virtual and wide screen film technologies can simulate any event in the Earth’s evolution, from the Big Bang to the future. Visitors to Our Dynamic Earth can experience earthquakes, volcanoes and the processes which formed natural settings like Edinburgh’s. Sir Michael Hopkins Architects’ design helps visitors to relate to the grandeur of natural forces which the exhibition illustrates to the species of the site and its human history. 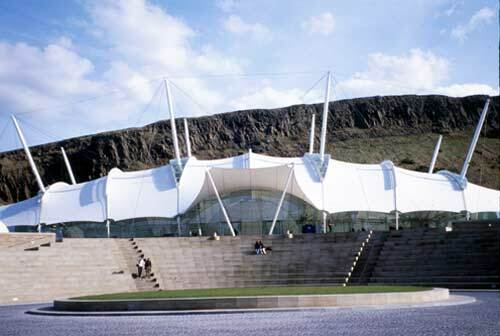 Our Dynamic Earth’s design comprises three main parts: the fabric roof and its structure, a main two storey building which contains the exhibition, offices and workshops, and a forecourt. The first makes a generous entrance pavilion which looks towards the hills and the city; although weathertight, its form and glass walls give the feel of an outdoor space. A hemispherical dome to a multi-media theatre bursts into the space, indicating something below. Two other structures rise into the Dynamic Earth pavilion, both containing staircases and lifts to the exhibition and retail facilities for visitors who might want to linger. Michael Hopkins & Partners made the two storey exhibition space is a black box to give ideal viewing conditions. Offices and workshops are on either side of it. An old wall which once formed the edge of a brewery is restored and extended to make the external wall of the black box, suggesting in microcosm Edinburgh’s fruitful relationship between geology and human intervention. The third component used by Michael Hopkins is a monumental forecourt, a new public space adds to Edinburgh’s legacy of generous civic design, and its amphitheatre can be used for outdoor performances during the Edinburgh Festival; just as its neighbours, the venerable Holyrood Palace and the new Parliament building use architecture to suggest political evolution, so the Dynamic Earth Project uses architecture to connect natural history to human and civic life. Dynamic Earth AR1238: “plainly a descendant of the amenity building at the Inland Revenue Centre at Nottingham, and the Mound Stand at Lord’s cricket Ground, London…the structure has an exotic insectival appearance”.